20150117 + UP in the am and to G's basketball game. They won. Home and G&I headed out with a stack of papers to get sponsorship for G's baseball team. G walked in to the 14 places we went to and asked for the Manager. He would then explain what he was doing and what he wanted. The Managers all were very nice to him and one from Cane's even gave him a free kids meal. G had a good time doing it, I think he will be a salesman :-) Home and ran D to baseball clinics, then ran G there. I watched J play some xbox and then got G. G&I played on the xbox for a bit between paperwork. 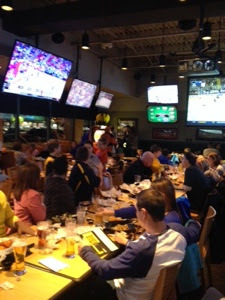 Ran and got D and then had dinner with G's baseball team at Buffalo Wild Wings.